I would have to say that Mazzer has to be the greatest commercial coffee grinder I have tried. I have a small coffee shop that I set up around 5 years ago. I have many patrons because I offer great service and the coffee I give them are all fresh and were sourced directly from the best farms here in our country. Also one of my secrets has to be the coffee grinder I use that grinds perfectly, thus the coffee grounds come out perfectly and the taste turns out to be awesome. 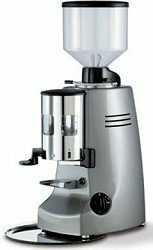 I have tried other coffee grinders in the past, but the Mazzer brand is the best of them all.